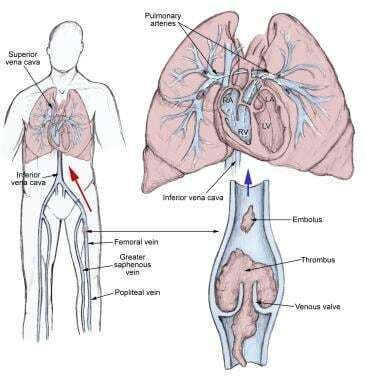 Pulmonary emboli usually arise from thrombi that originate in the deep venous system of the lower extremities; however, they rarely also originate in the pelvic, renal, upper extremity veins, or the right heart chambers (see the image below). After traveling to the lung, large thrombi can lodge at the bifurcation of the main pulmonary artery or the lobar branches and cause hemodynamic compromise. The pathophysiology of pulmonary embolism. Although pulmonary embolism can arise from anywhere in the body, most commonly it arises from the calf veins. The venous thrombi predominately originate in venous valve pockets (inset) and at other sites of presumed venous stasis. To reach the lungs, thromboemboli travel through the right side of the heart. RA, right atrium; RV, right ventricle; LA, left atrium; LV, left ventricle. Pulmonary thromboembolism is not a disease in and of itself. Rather, it is a complication of underlying venous thrombosis. Under normal conditions, microthrombi (tiny aggregates of red cells, platelets, and fibrin) are formed and lysed continually within the venous circulatory system. The US Food and Drug Administration (FDA) has extended the indications for the oral anticoagulant apixaban, a selective factor Xa inhibitor, to include the treatment of pulmonary embolism (PE) and deep venous thrombosis (DVT), as well as the reduction of PE and DVT recurrence risk. The drug was previously approved for stroke and systemic embolism risk reduction in nonvalvular atrial fibrillation and for PE and DVT prophylaxis following hip- or knee-replacement surgery. The classic presentation of pulmonary embolism is the abrupt onset of pleuritic chest pain, shortness of breath, and hypoxia. However, most patients with pulmonary embolism have no obvious symptoms at presentation. Rather, symptoms may vary from sudden catastrophic hemodynamic collapse to gradually progressive dyspnea. The diagnosis of pulmonary embolism should be suspected in patients with respiratory symptoms unexplained by an alternative diagnosis. Perform diagnostic testing on symptomatic patients with suspected pulmonary embolism to confirm or exclude the diagnosis or until an alternative diagnosis is found. Routine laboratory findings are nonspecific and are not helpful in pulmonary embolism, although they may suggest another diagnosis. Immediate full anticoagulation is mandatory for all patients suspected of having DVT or pulmonary embolism. Diagnostic investigations should not delay empirical anticoagulant therapy. Thrombolytic therapy should be used in patients with acute pulmonary embolism who have hypotension (systolic blood pressure< 90 mm Hg) who do not have a high bleeding risk and in selected patients with acute pulmonary embolism not associated with hypotension who have a low bleeding risk and whose initial clinical presentation or clinical course suggests a high risk of developing hypotension. Long-term anticoagulation is critical to the prevention of recurrence of DVT or pulmonary embolism, because even in patients who are fully anticoagulated, DVT and pulmonary embolism can and often do recur.